It’s important to know upfront, Resident Evil 7 isn’t really a Resident Evil game, for better or for worse - mostly for the better. Sure, it says “Resident Evil” on the box, but what Capcom created has little to do with the world they’ve been expanding for the last twenty years - instead it’s something more akin to indie horror titles like Amnesia: The Dark Descent, Outlast, or Layers of Fear. Franchise mainstays like The Umbrella Corporation are hardly mentioned by name, the main characters like Leon Kennedy and Jill Valentine are all missing (aside from one very brief cameo), and ostensibly it plays nothing like any game in the series before. It’s clear that Capcom took their missteps in Resident Evil 6 to heart - gone are the large action set pieces, the over-the-top characters, and almost anything that felt Resident Evil-like. Instead, the developers have opted for small intimate jump scares and a tense feeling of helplessness. All in all, it makes for a good game - just not one that feels tonally familiar to franchise veterans. This not a Resident Evil game that plays like modern survival horror. This is a modern horror game that gives a cursory nod to Resident Evil. 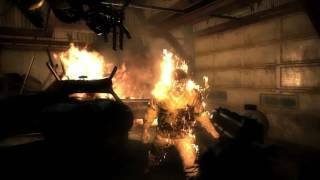 It’s hard to tell exactly where this falls and how it connects to the Resident Evil cannon - and I’m a little surprised Capcom didn’t just decide to reboot the whole series, using this as a starting point. In fact, the franchise developer/publisher may have done a disservice to themselves by sticking a “7” on the end of this game, as it begs to stand alone from any other entry in the chain. There are some minor aspects that will please seasoned fans. You’ll still use maps to navigate your way through strange locations that for some reason use animal-shaped keys, random healing herbs are still hidden everywhere, and you’ll still wait until the last minute to fire a shotgun round into a monster’s head in the interest of saving bullets. And in those few ways, Resident Evil 7 feels like it has more in common with the series than the last two numerical entries. Still, this game is a stark contrast to the earlier entries or the best known of them all, Resident Evil 4. It’s nastier than any prior Resident Evil game and feels almost nihilistic about its horror early on, reveling in the gruesome torture leveled at the protagonist. That protagonist is Ethan Winters, whose wife Mia went missing three years before the game begins. Though she had been presumed dead, Ethan receives an email that convinces him she is alive and in Louisiana. Soon after setting off, Ethan’s faith is rewarded as he finds Mia and attempts to rescue her, but when she attacks him, he quickly realizes she’s quite a different woman than the wife he remembers. Their escape attempt is swiftly foiled and soon Ethan is captured by a disturbed family who live in the derelict mansion where the game is set. The writing is serviceable. The family members are fleshed out a bit through notes and diary entries, but they still feel a little one-note. Ethan has almost no depth to his character, but Capcom clearly hopes to have players insert themselves into Ethan’s shoes - hence the first-person view. Still, the best character in RE7 might be Mia. Though we never learn too much about her history with Ethan or even her life before this incident, there’s a nice twist about two-thirds through the game that makes her easily the most interesting in the cast. The way the game unravels is actually an impressive throwback to the earlier days in the series. Our protagonist is thrown unwittingly into a situation far beyond their comprehension and nothing much changes except the scenery. Resident Evil 7 doesn’t so much have a plot as it simply shuffles you from one haunted house to the next. Sure, what you’re looking for and how you kill the bad guys might change, but mostly you’re just trying to stay alive and escape whatever house of horrors you’re currently stuck in. But it makes for a fun game - and a decently tense experience. Resident Evil 6 might have been better for laughs than it was for scares, but the latest entry in the series is all business in the beginning. Again, this game is aping from the current best in the survival horror business, but at least they do it well. The opening moments of the game are terrifying and it isn’t until a few hours in that the scares start to fade away. Even when you’re white knuckling the controller, fearing what lies around each corner, Resident Evil 7 builds tension by taking away weapons, making ammo scarce, and forcing you to run for your life. These aren’t scripted chases either, there are just some moments when you might be out of ammo (or trying to conserve it) and you’ll have to make a mad dash down a hallway to escape an enemy. These moments create natural tension and fear without resorting to cheap jump-scares. It’s a great act, but Resident Evil 7 can’t keep it up for the whole adventure - in the final stages I found myself with an abundance of ammo and unphased by any of the frights the game had left in store. Why do you need all that ammo? Well, like most Resident Evil games, every corridor and room may be hiding a monster that wants nothing more than to end you with a grisly murder. The franchise has been moving away from zombies since Resident Evil 4 went for a more parasitic take on the infected, and with Resident Evil 7 the break is all but complete. The majority of enemies are monsters that emerge from a black, slime-like substance found throughout the game called “Molded”. Their secondary form is similar to the Licker from Resident Evil 2, a nimble creature that crawls on all fours. Lastly, there’s the “Fat Molded”, a boated form of the monster that vomits onto players causing damage. There’s also a section where you’ll have to battle hives of giant insects. It may seem light on variety, but the restraint helps make the experience a tighter one. The game never throws hoards of monsters at you and each encounter feels well thought out. Then there’s the Baker family, but I’ll avoid talking about their motivations and encounters as that leans dangerously into spoiler territory. Some of the best moments in the game materialize when you find video tapes that act as flashbacks. The tapes sometimes are used to push the plot forward from Mia’s perspective, but also to reveal the fate of a camera crew that stumbled into the house while filming a ghost-hunting show at an earlier point in time. These moments are great because their short play-time mean that Capcom can fret less about enemies and ammo and more about crafting some good scares. They also can be used to advance in the game, giving you information about the horrors ahead. There’s certainly some clunkiness in the updated controls because of the new perspective, but this feels intentional. Resident Evil 7 is a horror game first, a shooter second - a distant second. The clunky movement makes it all the more terrifying when you think something is behind you, the inaccurate weapons mean that you really might waste too many bullets trying to bring down the monsters. There are some large-scale fights that take place, and while you likely won’t struggle with them too much, they do feel out of place with the mechanics. Aiming for a certain spot while on the move is going to be hard, so it’s unfortunately poor design that certain fights call for such action. Still, it works far more often than it doesn’t. What really works are the times when the game slows down and becomes a more cerebral experience. 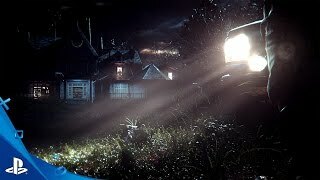 Whether it is solving puzzles or trying to figure out where the next key is hidden, it’s nice to see Resident Evil 7 steer away from shooting rocket launchers at skyscraper-sized monsters and spend more time with eerie shadow puzzles. The game also has plenty of secrets to find and collectibles to brag about. These collectibles can be used to get better stats and weapons, leaving you with another difficult choice: waste the resources scouring the house for extras or conserving your supplies and skipping the bonuses. Make no mistake, the “survival” is back in this survival horror. Conserving ammo and healing supplies is something you’ll always want to be conscious of and every time you stumble into a save room, you’ll breathe a sigh of relief (especially when they have the crates that hold your stash - as the carrying inventory is very limited). It’s nice to have a Resident Evil game that makes you think twice about the weapons you carry and items you craft. The crafting element isn’t significant, but more in-line with older games - herbs can be made into first aid, gunpowder can become bullets. 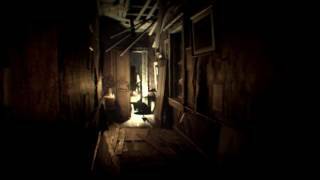 Resident Evil 7 will likely have you scouring the dark corners of each room looking for goods. Not only is Resident Evil 7 a dark game, it’s largely washed out and devoid of color. It’s all in service of making for a scarier experience, which is nice, but it is a little hit and miss. Ethan won’t turn on his flashlight unless it’s scripted, meaning you’ll be squinting at the screen trying to make out what you’re looking at. The same is true with the sound design. Sometimes the squishy sounds of monsters emerging or the heavy clump of enemies walking closer sets you on edge, but other times enemies sound like they’re right behind you when they’re nowhere to be seen. It’s unnerving at first, but when you’re forced to hide from an enemy it feels to cheap to not be able to tell where they are. One thing you won’t have to worry about when stumbling around in the dark is the game crashing. Resident Evil 7 was a very stable experience for me on the launch PlayStation 4. There have been reports of people getting sick while playing, the game even warns you to turn the “Camera Wobble” off if you’re feeling nauseous, but I didn’t have any problems like that. There’s a few long loading times in between the video tape scenarios and deaths, but it didn’t bother me much. The game can also be played entirely in PlayStation VR, but this was not tested in the scope of this review. Resident Evil 7 is a very good game. Its aesthetics may be wanting at times, and its controls are a bit wonky, but the core of what Capcom has here is rock-solid. There are scares a-plenty, exciting shootouts, horrifying deaths and grisly killings. The game boasts plenty of tension and some really smart design choices. This may not feel quite like a traditional Resident Evil game, but when it is this good, who cares? I get that the gloomy art design and confusing sound mixing are in service of making the game scary, but that doesn’t make them any better. Again, the clunky controls make for more tension, and they aren’t awful, but it’s puzzling why certain fights call for a precision the mechanics obviously lack. Each location in Resident Evil 7 is filled with scares that make you jump and puzzles that make you think. It’s an absorbing experience - which is perfect for a horror game. There are some long loading times, and others are reporting sickness due to the camera, but none of that bothered me. Resident Evil 7 doesn’t have much in common with the rest of the franchise, but when the game is this good, it’s hard to complain. Definitely worthwhile for any survival horror fans. "Long running franchise switches to a new, modern take on horror"
Resident Evil 7 is ranked #511 out of 1434 total reviewed games. It is ranked #42 out of 174 games reviewed in 2017.